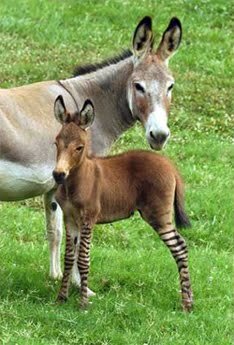 Z-Donk's are a cross between a zebra and a donkey. They have the same characteristics as a mule or hinny. They carry an odd number of chromosomes, there for they are also sterile. Z-Donk's tend to be a more alert and bull headed animal than the typical mule. The zebra in them makes them unpredictable, at some points. Since the animal is a hybrid they can be classified as a mule. Depending on the judges, they can be shown in the mule classes. Z-Donk's can be a variety of colors, however most have the gray base with stripes throughout their body. Bold striping on their legs and head are very common. Most show one or two stripes on their ears. They tend to look more like a mule and donkey. A long thick head, donkey mane and tail, large ears, and shorter coat. The most typical Z-Donk cross is between a Grant Zebra stallion and a Standard Donkey Jenny. 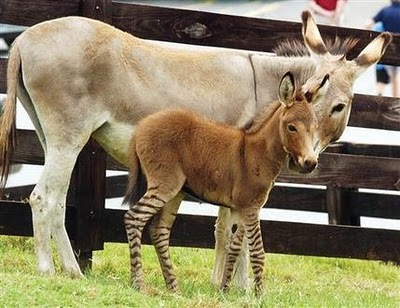 Z-Donk's are a cross between a zebra and a donkey. They have the same characteristics as a mule. They carry an odd number of chromosomes, there for they are also sterile. Z-Donk's tend to be a more alert and bull headed animal than the typical mule. The zebra in them makes them unpredictable, at some points. Since the animal is a hybrid they can be classified as a mule. Depending on the judges, they can be shown in the mule classes. Z-Donk's can be a variety of colors, however most have the gray base with stripes throughout their body. Bold striping on their legs and head are very common. Most show one or two stripes on their ears. They tend to look more like a mule and donkey. A long thick head, donkey mane and tail, large ears, and shorter coat. The most typical Z-Donk cross is between a Grant Zebra stallion and a Standard Donkey.